I recently saw a posting at a local college for "therapy dogs" visiting campus. I queried my FaceBook friends if "therapy dog" might be an oxymoron! Sometimes you just need to go to the dogs to get back to what's important! This reminded me of a trip I took a couple of years ago. After virtually ignoring my younger daughter for months of college travel and essay assistance with her older sister, I decided to surprise her with a bucket list trip to go out on a real dog sled! She had one weekday off after her high school exams, so we headed up Rt 93 in New Hampshire to have a couple of nights of adventure, including meeting sled dogs and a dogsled ride out into the White Mountains National Forest. As we made our way north traveling from crowded super highways to the virtually deserted elevated two lane highway cutting through the New Hampshire National Forest, we felt the stresses of the flat lands slip away and when we arrived at The Mountain View Grand, we felt transported into a life sized snow globe tucked under the White Mountains. The temperature was hovering in the single degrees, but the welcome at The Mountain View Grand was warm! Fortunately, being hardy New Englanders, we were well prepared for the cold. As I've always told my Girl Scouts over the years; "there is no bad weather, only bad clothes". 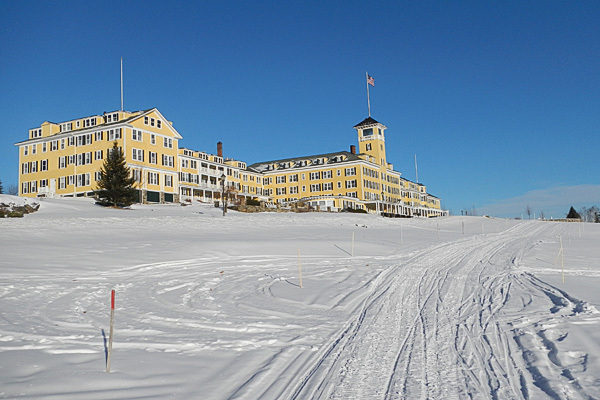 The Mountain View Grand is an historic hotel with a panoramic view of the Presidential Range and Mount Washington from the front porch and some of the guest rooms. Despite choosing a "bargain" room with a view to the rear of the property and the loading dock, we were still treated to distant mountain views and views of the resort's petting barn and cross country ski trails. We were very comfortable and the views were lovely in every direction! We took advantage of the rest of the day to explore the property on our cross country skis. There is a skating pond, cross country and snow mobile trails, an indoor pool, as well as a barn and pasture full of petting zoo farm animals. When you arrive at the resort, you receive a full menu of resort activities beginning with daily barn tours to feed the animals in the morning and ending with s'mores on the fire by the skating pond! You can ski, skate, snowmobile, or snowshoe right on the property. If you don't have your own equipment, there is a facility at the edge of the skating pond that rents any of this equipment and will provide lessons. We were delighted to meet families from all over the United States including quite a few tots from warm weather climes experiencing snow and the ice on the pond for the first times in their lives! Miles of trails designated as mixed, ski/snowshoe or snow mobile ring the property and if the cold doesn't steal your breath, the scenery will! A petting barn full of domesticated animals is the site for farming activities at the resort. That evening we enjoyed a nice dinner in the casual Harvest Tavern at the Mountain View Grand, deciding to enjoy the amenities of the resort rather than make our way into the ski towns nearby. The following day, we had a morning sled ride scheduled at the nearby Muddy Paws Sled Dog Kennels. As we packed every piece of warm clothing we owned into our car, we noticed the thermometer in our car register 1 degree F! When we arrived at the kennels we saw that the dogs were kenneled outside, as they always are. These dogs are largely rescue dogs, taken in by the kennel when their owners can no longer afford to maintain them or when the get too old to be useful for transportation in northern areas where they rely on sleds. But the dogs can find new life doing short tourist trips, or be adopted by families. We were encouraged to bundle up, and additional warm clothing and sleeping bags were offered if what we brought had not been enough. We went outside with our musher who allowed us to interact with many of the dogs. Although the conditions they live in seem harsh compared to our pampered pets at home, these working dogs are very well cared for and they were delighted by the prospect of being hitched to a sled and running. When the musher appeared with the harness, all of the dogs began vocalizing in excitement, the cacophony making it difficult to hear the musher! However, once the lead dog was harnessed, most of the dogs settled down, being so intelligent, they realized it was not their turn to run, since the leader dog was not part of "their" team. However, the rest of the dogs on the team began to get EVEN more excited! The musher shared the process with us, allowing us to assist putting on booties and adjusting the harness. After spending about 30 minutes or so getting set up, we bundled up inside the sled under sleeping bags, adjusted our goggles and were off along the trails in the National Forest. A recent snowfall allowed the dogs to break new snow, which seemed to get them even MORE excited. We were able to see virgin snow with only moose tracks! Our musher warned us if a moose appeared to be prepared for a bit of a wild ride since the dogs got very excited by moose and it would be a job for him to keep them on task! Luckily, though we saw evidence of the moose, we didn't encounter one, and our chilly ride was over too soon! After returning to the hotel, we hit the hot tub and indoor pool to warm up, and then ended the day out by the skating pond enjoying S'mores by the fire! There was no better "therapy" for us after a busy time than to reconnect with the help of the animals and to relax by the roaring fire! Planning our sled dog ride was simple enough, I contacted Muddy Paws Kennels, http://dogslednh.com/ a sled dog rescue operation in New Hampshire to arrange a private tour of their kennels and sled ride on trails in the National Forest. After assuring they could accommodate us, I booked the Mountain View Grand in Whitfield, New Hampshire, because they were offering a midweek special rate that fit our budget. One could book the sled dog experience directly through the Mountain View Grand, and the dogs will come to you, however, I was very glad we we decided to go to the kennels. They were humble, but we got to see the dogs in their own element, and meet them all, not just the ones running our sled. We also learned later that because of the very cold weather, the lodge based sled trips had all been cancelled because although the dogs are very acclimated to the cold; it's unsafe for the dogs to get heated up on a run and then ride home in their unheated trucks. Another option for dog sledding adventures is Mahoosuc Guides in Maine. I have not toured with them but can vouch that the Maine Guiding standards are very high and most visitors to Maine can expect Certified Maine Guides to be very professional and safe! some comfy shoes for walking around the interior of your room or the resort so you don't track mud and snow everywhere.